Shure PGX24/SM58 Wireless Microphone Vocal System DJParts - All Variety of Parts that DJ Needs. Home > DJ Gear > DJ Microphone/Wireless System > Shure Microphone > PGX Wireless (UHF Frequency Agile Wireless Microphone System) > Shure PGX24/SM58 Wireless Microphone Vocal System - Free Shipping!!! Shure PGX24/SM58 Wireless Microphone Vocal System - Free Shipping!!! 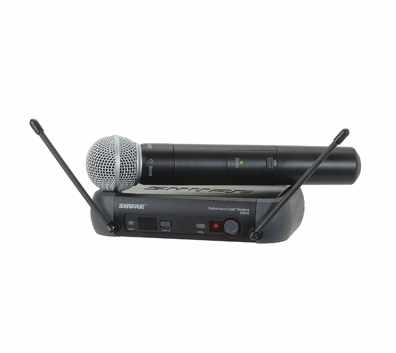 Includes PGX2/SM58 Handheld Transmitter and PGX4 Diversity Receiver. Legendary live performance featuring superior clarity and warmth. Ideal for lead and backup vocals.